Exeter Cathedral’s very own Dean invites you to a bespoke Tour at the Deanery to discover the extensive collection of religious Icons, which he has been collecting for over 25 years. Jonathan will describe how icons are produced and for what reasons, and how the materials can differ. There will be some examples from Russia, Georgia and another depicting the transfiguration. £20 with a glass of wine and conversation, booking essential. This is a reprised tour due to popular demand. The Very Reverend Jonathan Greener trained for ordination at the College of the Resurrection, Mirfield. He studied Theology and Religious Studies at Trinity College, Cambridge. 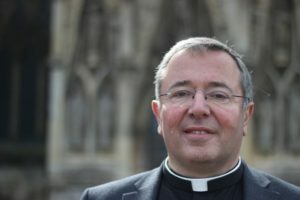 He served his title as Curate at St Matthew, Elephant and Castle, in the diocese of Southwark from 1991 to 1994 before becoming Bishop of Truro’s Domestic Chaplain from 1994 to 1996. From 1996 to 2003 he was Vicar at the Good Shepherd, Brighton in Chichester diocese. From 2003 to 2007 he was Archdeacon of Pontefract in Wakefield diocese. From 2007 to 2017 he was Dean of Wakefield, and was installed as the 71st Dean of Exeter on Sunday 26th November 2017.